Between 1908 and 1915, there are two sets of Chicago death certificates listed in the Family History Library Catalog. One group (the largest) is organized by "certificate number"--the number you find in the online index. The other group is organized by "register number"--the number you find in the Chicago Death Index, 1871-1933, a microfilm index. So, what's the difference between the two groups? In some cases, but not necessarily all, the record found in the register number group appears to be a copy of the original death certificate. The writing is neat and in one hand. However, I don't think all of the records in the register number group are copies. I was unable to find a death record on a certificate number film today--it seemed to be missing--and when I located the corresponding record on the register number film, the record looked to be original. More are more Chicago city directories are appearing online. A number of years are available in PDF format at www.chicagoancestors.org (Look under the "Tools" tab. Directories are also available at www.footnote.com. This is a subscription site, but you can access it for free at Family History Centers that have the portal set up on their computers. 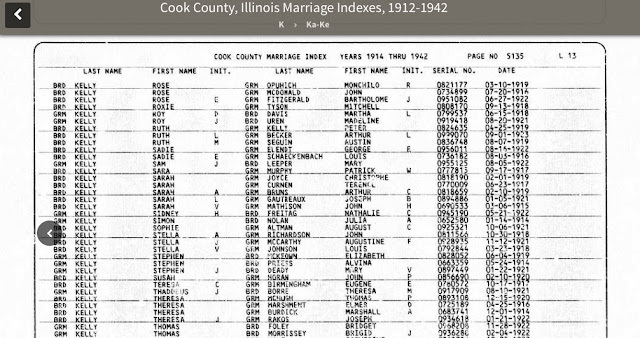 Chicago death certificate blanks didn't have a place to record parent names until 1910 but if you find an infant in the index under "Unknown SURNAME" it's very likely that the actual record will read "Child of Given Name and Given Name SURNAME." If you're looking for infants who were born and died between census years, it's worth checking the death records for unknown infants.